The sun was shining on tens of thousands of people who turned out to enjoy the Durham Miners’ Gala. 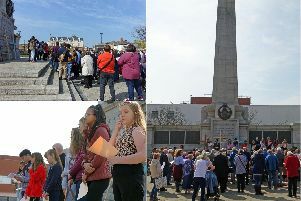 Ex-miners and their families from colliery communities across the country proudly carrying their banners marched the traditional route from the city’s Market Place to the Racecourse. They were joined by unions and campaign groups as they made their way along the streets watched on by tens of thousands of people of all ages. Many taking part believed this year was the biggest one yet with even more banners showcased than in the past. This year was the 134th Big Meeting and the turnout did not disappoint. Speakers included Labour leader Jeremy Corbyn, veteran MP Dennis Skinner and Shadow Foreign Secretary Emily Thornberry. Musician Billy Bragg also gave a performance after the speeches. I think it’s a great day for everyone. Former miner John Watson said: “The event is the biggest it has ever been. There are more and more banners getting replicated and joining us. The Racecourse was the end location for all those who had marched. Fairground rides and music entertained the crowds, while a number of speeches were given by a number of guest speakers. Dad Alan Burnham, from Brandon, Durham, was at the gala with his sons Nathan, 16, Lennon, 10 and Rocco, three.